Sadly, many young people experiment with alcohol, tobacco and perhaps even illegal drugs at some point. Although the UK government has tightened legislation to make it harder for young people to buy alcohol and cigarettes, they still seem to be able to get there hands on it. 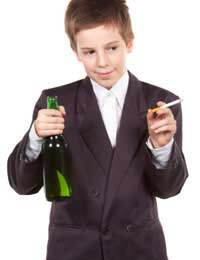 How Do Our Children Get Alcohol and Tobacco? The simple fact of the matter is that many of our children look older than they are and it is difficult for shopkeepers to judge their age. In some cases, older individuals procure alcohol and tobacco for their younger counterparts and often encourage such behaviour. Shopkeepers are advised where possible to ask for identification with definitive proof of age before selling alcohol to anyone who they suspect may be under age. They must have an approved licence issued by a magistrate which authorises them to sell alcohol to anyone over the age of 18. Failure to comply with these rules can result in fines of up to £5,000, loss of their liquor licence and possible custodial sentencing if such offences persist. Previously the law stated that the legal age at which an individual can buy cigarettes was 16. However, with changes implemented by the government in September 2007, the legal age that an individual can buy cigarettes is now 18. It is a criminal offence to sell cigarettes to anyone under the revised age of 18 and the penalty is a hefty fine and possible prosecution. Trading Standards regularly conduct spot checks and so-called 'mystery shopper' tests to see if shopkeepers are adhering to the guidelines. If you are responsible for the sale of tobacco or alcohol in a shop, it is always worth asking for identification if you are not entirely convinced that the individual in question is over the required age limit. Most local authorities are now working in conjunction with the National Health Service (NHS) and Citizencard in order to provide a recognised and universally accepted form of identification for individuals under the prescribed age limit. If someone cannot provide proof of identification when asked, do not make the sale and ask them to return with the relevant identification if they wish to make a purchase. Most people, if they are genuine, will understand your willingness to protect both those individuals who are underage and also your own livelihood. For more information about young people and alcohol, read our article Combating Underage Drinking.